Contrary to what many people think, sushi is not synonymous with raw fish. In fact, it is possible to have traditional, yet vegetarian sushi. Sushi refers to sticky rice that has been seasoned with rice wine vinegar and then cut or shaped into small, bite-sized pieces. It is commonly wrapped with seaweed. Additional ingredients, which sometimes include fish, are used in regular sushi, as either a topping or as the center of the wrap. Vegetarian sushi uses other ingredients for the topping or wrap center, such as raw or cooked vegetables, or tofu. Another raw fish and rice preparation known as sashimi is often confused with sushi, especially since raw fish is one of the most popular ingredients in sushi. So, you cannot technically have vegetarian sashimi. However, you can leave the fish out entirely and make great vegetarian sushi. Also if you eat fish, keep in mind that there are many types of sushi with cooked fish if you prefer it to the raw varieties. Many people find that following a vegetarian diet, even part of the time, can help them enjoy healthier food choices if and when they return to a non-vegetarian eating plan. Of course, as with any diet it is important to find a variety of appealing dishes to enjoy. So, whether you are eating a wholly vegetarian diet or are just looking for a new dish for your repertoire, vegetarian sushi is a great option. You can use nearly any vegetable in your vegetarian sushi; you are only limited by your creativity and resources. However, there are some traditional combinations that you may want to try. 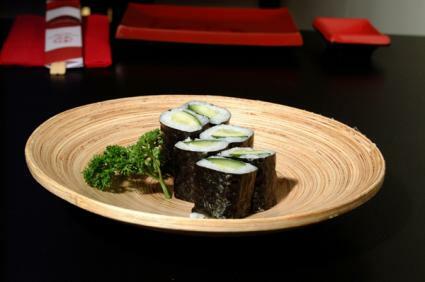 Cucumber, cream cheese and avocado: This sushi has the perfect combination of smooth and crunchy textures. Keep in mind that it is higher fat than some of the other vegetarian options because the cream cheese and avocado are both fat-laden. Tofu and green onions: This protein-packed sushi is low fat and delicious. You can try using fresh or dried tofu for variations on this classic. Mushrooms: While many types of mushrooms are popular in vegetarian sushi, the small size and shape of the Shitake makes it ideal for this preparation. Roasted eggplant and zucchini: For a hearty vegetarian sushi, try roasted or grilled eggplant and zucchini. The bold flavors are satisfying, but the resulting sushi is very low-fat and healthy. Carrots, daikon radish and cucumber: If what you want in your sushi is big crunch, this may be the choice for you. All three of these vegetables are prepared in thin slivers and wrapped into the center of a sushi roll, which is then sliced. The daikon has a spicy bite to it that is perfectly complemented by the sweet carrot and refreshing cucumber. Often, the daikon sprouts are used as well. Tempura sushi: Sometimes sushi is battered and deep fried, tempura style. Vegetarian tempura works quite well with carrots, eggplant, zucchini and sweet potato. Egg sushi: Japanese scrambled eggs, called Oboro, are often used in vegetarian sushi. For those vegetarians who eat eggs, it is not only delicious, but a good source of protein. Some other ingredients that are commonly used in vegetarian sushi are kelp and seaweed, bamboo shoots, cabbage, edamame (green soybeans), pickled ginger, chilies or chili paste, beets and taro. There are also varieties of sushi made with fruit, such as plums or persimmons. If you are eating in a restaurant, ask about their house specialties, and if you are making sushi at home, try to create your own innovative combinations. Sushi is traditionally served with wasabi, which is Japanese horseradish, pickled ginger and soy sauce. Many types of sushi already have wasabi inside them, so you may want to take a test bite before adding more. If you do want to add wasabi, simply mix a little of it (it is the green paste on your plate) with your soy sauce. Then, pick up your sushi and dip it in the mixture. How to roll your own sushi provides step-by-step instructions.